The last weekend of 2018 is the most wonderful weekend of the year, as long as you're a movie playing in theaters. Nearly everything sees a holiday bump and the declines are absolutely respectable (with one logical exception). Aquaman continues to be the big holiday winner in this Star Wars-less December. It's a second weekend of $51.5 million for Aquaman, giving the DC film $188.7 million in two weekends. A 24% weekend decline is a completely acceptable outcome here; superhero movies are pretty much never known for their legs. After the $68 million opening weekend, Aquaman got a big bump to $22 million on Christmas Day and each day since then it's been a mid-upper teens performer. 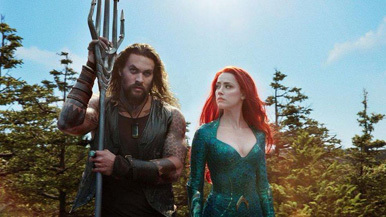 New Year's Eve is typically depressed, but New Year's Day will have Aquaman clear $200 million with ease, as it's probably a weekend away from crossing Justice League's $229 million - which shows had badly Zack Snyder messed that one up. The wheels tend to come off quickly post-holiday season, but Aquaman is going to make a run at $300 million, and the next target after Justice League is Man of Steel's $291 million. Mary Poppins Returns holds in second place with $28 million, a 19% increase from last weekend. It's got $98.9 million after two weekends. Get used to seeing a musical released every Christmas now, after last year's The Greatest Showman and now this performance. While Disney was probably very worried about the film after last weekend, the weekday returns were incredibly strong since Christmas Day, taking in $10 million each of the other weekdays. It's likely still a notch below their expectations, but the magic of the last week shows how much a film's fortunes can improve. Crossing $100 million on Monday, it's headed to at least $150 million, with more if it can survive the post-holiday weekend largely intact. Bumblebee adds $20.5 million, down just 5% from opening weekend, giving it $66.7 million in two weekends. I'm actually wondering if calling the film "Transformers: Bumblebee" would have been helpful or harmful to the total. Despite great reviews and decent word-of-mouth, it's still headed for less than what The Last Knight did in 2017, which was only $130.1 million. I think it shows how Michael Bay completely killed the franchise with that one. It's doing...okay overseas so far, but it's yet to open in China (which pretty much is why we got so many Transformers sequels to begin with), so that is truly the make or break point when we look back at this one and if there will be future spinoffs. Spider-Man: Into the Spider-Verse crosses $100 million in style with $18.3 million, an 11% increase from last weekend. It's got $103.6 million in three weekends. Sony should be really happy with this total, and word-of-mouth is still going strong, as crowded as the Christmas box office got. I think it's headed to $150 million, which would ensure that we get a sequel.